Random Thoughts and Musings: It's been a month, part 1: traveling! It's been a month, part 1: traveling! Apparently, I've had other things to do besides write blog entries... What have I been up to for the past month? Quite a bit, actually. I'll do you a favor and break the info up into a short series of five posts: Traveling, Games, Books, Fitness, and Work. There will probably be some overlap with several of them. Let's start with traveling! 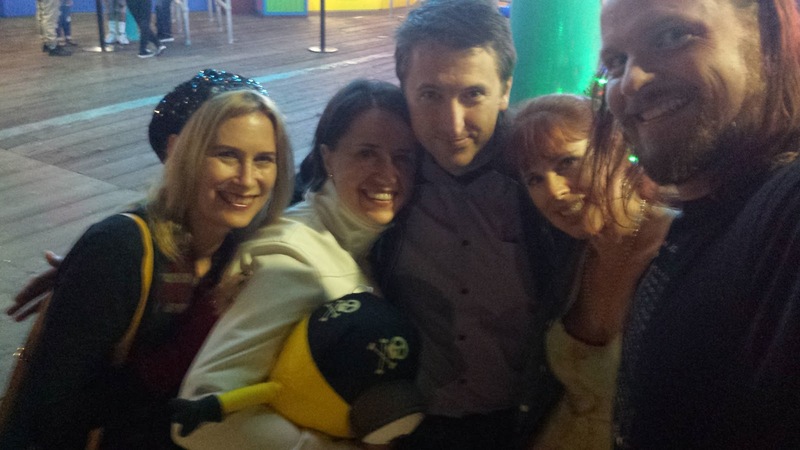 And yes, that's a minion in Tanya's arms. Ken (the guy on the right) actually won it for me, but I gifted it to Tanya. He (the minion, not Ken) now sits in my office in any case. We've got one more pre-planned trip coming up. We're going to Colorado for a semi-active vacation with the boys. I'm not sure either boy is ready even for the "semi" part of the activities, but Tanya and I are determined to get them outside a bit while they're still somewhat young and impressionable. We'll be riding the Durango-Silverton steam train, going rafting, taking an all-day hike, and learning stuff at Mesa Verde. It will be the first time the boys have seen mountains in real life. I hope they're as impressed as I was the first time I saw them. In other traveling news, I'm teaching Garrett to drive. He's already 16, but hasn't shown any real interesting in learning to drive. I recently asked him why that was, and he said "well, there's nowhere I really want or need to go." I distinctly remember wanting and needing to get my license as soon as I turned 16. I wanted to drive myself to school, the store, Brian's house, or other places as needed. I wanted to be able to cruise 57th (not that I ever did, but being able to was a big deal). I suppose it was more disconnected time... the Internet in general and cell phones weren't a thing and entertainment was harder to come by. Ah, to be a kid in today's society! How many video games would I be playing right now? Speaking of video games... stay tuned for the Gaming installment! It's been a month, part 5: work! It's been a month, part 4: fitness! It's been a month, part 3: books! It's been a month, part 2: games!